Is Bloating and Weight Gain Different? Bloating and weight gain are two different things. Abdominal bloating is described as a feeling of tightness or fullness around the stomach. 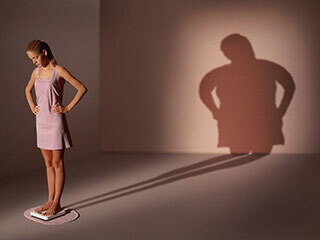 It can also be ascribed as unintentional weight gain, a condition when you don’t intend to gain weight. Bloating affects everyone in different ways. It could be in the form of abdominal tightness, or slightly bloated abdomen. The condition may be painful or cause shortness of breath. One’s stomach begins to cramp and pains become severe, and it can occur anywhere in the body and changes its location quickly. Women complain of weight gain and bloating few days before menstrual period. Bloating is also a common PMS symptom, which usually occurs due to excess water retention (water bloat). The plausible reasons for bloating weight gain include persistent constipation, irritable bowel syndrome, overeating, reflux, lactose intolerance and intestinal gas. The general perception as the cause of bloating is eating or drinking certain foods. It is an indication that food is not being digested correctly. Extreme bloating can be caused by the inadequate intake of water. Fatty foods, dairy products and foods high in sugar (sugar intolerance) may also cause bloating. Aerophagia (air swallowing, a nervous habit), partial bowel obstruction, gastric dumping syndrome, ascites, tumours Alvarez' syndrome, fiverticulosis and celiac disease, splenic-flexure syndrome, polycystic ovary syndrome and ovarian cysts are other less common reasons for bloating. Medications for medical conditions may cause bloating as they promote retention of fluid within the body, especially steroids, tranquilizers, antidepressants and lithium. If you suspect that prescription for a medical condition is increasing your weight, consult your health care provider. Depression and anxiety could also make you eat more and exercise less. Water benefits the body by aiding digestion as it supports a majority of the body's daily functions. Once these foods get digested, bloating will fade. Meals high on fat are difficult to digest, and cause spasms and bloating. One can do several things to digest fats, walking for few minutes after meal is the easiest way. Bloating and unnecessary weight gain can be prevented with an engagement in physical activity, which encourages activity in the bowels. Moreover, abstain from excess chewing of gums or intake of carbonated drinks, especially the ones with high fructose or sorbitol to prevent unintended weight gain.